309 (29 Jan 45), 310, 311, 312, 313, 316(A), 317, 318, 319, 320, 321, 322, 323, 327, 328, 329, 330, 331, 332, 336, 338, 339, 340, 341, 342, 343, 344, 347, 350, 351, 352, 353, 354, 355, 359, 360 (15 Apr 1945). (A) Non-Credited aborted missions (Mechanical abort - Lost #1 engine). For Mission dates, targets and Mission Reports, see Combat Missions. 1Lt Robert E. Greene (P) - First mission (309) flown as CoPilot with a Combat Orientation crew, 2Lt Clarence J. Goodberlet (P). Last three missions flown as CoPilot with the Crew CoPilot flying as First Pilot (355, 359, 360). Completed his combat tour (35 credited missions) on 15 Apr 1945 (Mission 360). 2Lt Jerome C. Parson (CP) - Flew on 28 credited missions with 1Lt Greene (All of 1Lt Greene's missions except for 309, 323, 339, 340, 341& 342). Last three missions flown as First Pilot with 1Lt Greene flying as CoPilot (355, 359, 360). Flew on 2 missions as CoPilot with other Pilots (362, 363) Mission 363 flown as a Lead Crew CoPilot with 1Lt Werner G. Goering as Lead Crew Pilot. Completed 31 Credited missions on 20 Apr 1945 (Mission 363). 2Lt William J. Milligan (N) - Flew on all of the 1Lt Greene 35 missions except for mission 309. Flew on mission 335 with another Pilot. Completed his 35 mission combat tour on 15 Apr 1945 (mission 360). 2Lt George F. Oettinger (B) - Flew on 10 missions with 1Lt Greene (310, 311, 313, 322, 323, 327, 328, 329, 330, 347) and 7 missions with other Pilots (312, 336, 343, 348, 354 and 360 & 362 as a Lead Crew Bombardier). Completed 17 credited combat missions on 17 April 1945 (mission 362). The 1Lt Greene utilized Toggliers on 23 of his 35 credited missions and substitute Bombardiers on 2 missions. Sgt Joseph C. Rollinger (E), Sgt Joe C. Thompson ( R ) and Sgt Milton L. Jobe (TG) - Flew on all of the 1Lt Greene missions except for mission 309. Flew on their last mission (362) with another Pilot. Completed their 35 mission combat tour on 17 Apr 1945 (mission 362). Sgt John L. "Jack" Covert (BTG) - Flew on 32 missions with 1Lt Greene (All missions except 309, 354 & 355 where substitute Ball Turret Gunners were used). Flew on his last mission (362) with another Pilot. Completed 33 credited combat missions on 17 Apr 1945 (Mission 362). T/Sgt Ira J. "Jack" Williams (WG/TOG) - Flew on 25 credited missions with 1Lt Greene: As Waist Gunner (9 missions - 310, 311, 312, 313, 317, 318, 319, 323, 327); As Togglier (16 missions - 331, 332, 336, 338, 339, 340, 341, 342, 343, 350, 351, 352, 353, 355, 359, 360). Flew on two missions with other Pilots: As Waist Gunner (344); As Togglier (362). Most crews flew most of their missions without a Waist Gunner in March and April 1945 - much to the chagrin of the combat crews. 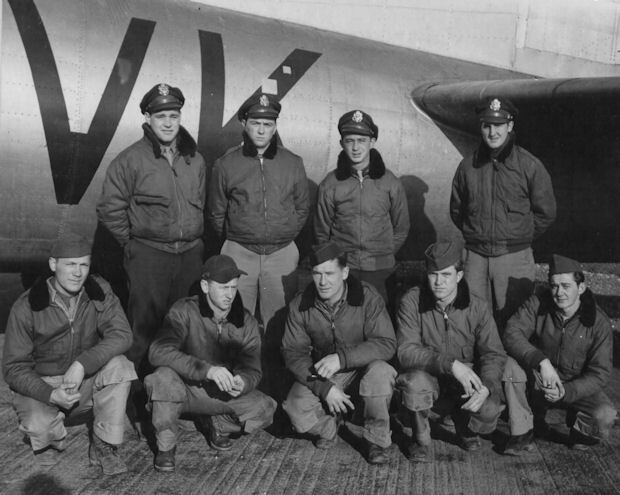 Completed 27 combat missions on 17 April 1945 (Mission 362). Lt Greene never had a regularly assigned B-17. See our Nose Art for photos of the named B-17s.